Swami Chinmayananda was one of the 20th century’s most world-renowned and revered exponents of Vedanta, the foundation of Hindu religion and culture. ﻿Born on May 8, 1916, in Kerala, India, Balakrishnan Menon acquired degrees in Law and English Literature before plunging into the Freedom Movement of India against the British rule. Balakrishnan’s nationalist activities led to his imprisonment, and after he was released, he worked for a newspaper called The National Herald. While working for The National Herald, Balakrishna decided to write an exposé on what he believed to be the bluff of the swamis in the Himalayan regions. To investigate and uncover such veils of alleged sanctity, he traveled to Ananda Kutir, Swami Sivananda’s ashram in Rishikesh. However, this was not to be so, as Balakrishnan’s journey to expose others ended up in exposing himself to his own spiritual revolution and evolution. Swami Sivananda’s divinity, love, and Vedanta teachings overwhelmed the young skeptic. A striking inner transformation unfolded within Balakrishnan, and he began questioning and reflecting upon the purpose of life and the secret of permanent happiness. In the company of saints, and through the clarity of their teachings, the highly intellectual seeker soon chose to become a renunciate himself. On the holy day of Mahashivaratri, February 25, 1949, Balakrishnan was initiated into sannyasa by Swami Sivananda, who blessed him with the name ‘Swami Chinmayananda Saraswati’. Chinmayananda means ‘filled with the bliss of pure Consciousness’. Swami Sivananda then guided the new ascetic to the most renowned Vedanta master of the time, Swami Tapovanam, who lived in Uttarkashi, in the Himalayas. Swami Tapovanam who rarely took on disciples put forth strict conditions to his new suppliant and all of the Self-realized Guru’s terms were readily accepted. As Swami Tapovanam’s disciple, Swami Chinmayananda led an austere life and underwent an intense study of Vedantic texts. Spiritually awakened through Swami Tapovanam’s tutelage and grace, and inspired by Mother Ganga’s continuous flow of purity and service to mankind, Swami Chinmayananda sought and received his guru’s blessings to spread Vedantic knowledge to the masses. Having seen widespread spiritual and social degradation in India, he felt the urge to share with others the knowledge that had brought fulfillment in his own life. Swami Chinmayananda conducted his first jnana yajna (a series of spiritual discourses) in December 1951, at a small temple in Pune, Maharashtra. Jnana yajna, a term he coined from Lord Krishna’s teachings in the Shrimad Bhagavad Gita, refers to the student who through scriptural studies performs the ritual of worship (yajna) at the altar of wisdom (jnana). His teachings were based on the authority of the Vedas and his direct experience. They were highly appreciated, and the number of devotees eager to learn from Swami Chinmayananda’s highly dynamic, logical, and witty discourses increased rapidly. An inspired band of devotees thus formed ‘Chinmaya Mission’ in 1953. From pulpits and platforms throughout India and around the world, Swami Chinmayananda taught the tens of thousands who came to listen and learn. 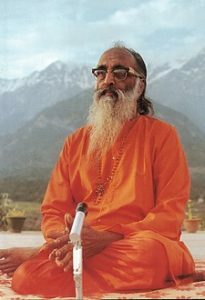 By the time he left his physical form and attained maha samadhi on August 3, 1993, Gurudev, as Swami Chinmayananda came to be known among his followers, had conducted 576 jnana yajnas as well as countless family spiritual camps, traversing hundreds of thousands of miles, crisscrossing the globe, and transforming millions of lives directly and indirectly. As dynamic, creative, serene and profound that he was, despite serious medical conditions and incessant world travel, Swami Chinmayananda authored over 35 books, including commentaries on the major Upanishads and Shrimad Bhagavad Gita. The latter work has been acclaimed as one of the most refined, insightful, and practical commentaries ever written on the Gita. The collection of his video talks on the Gita is heralded today as one of Chinmaya Mission’s most illustrious publications. Swami Chinmayananda is credited with bringing about a worldwide Vedantic renaissance in the late 20th century through his introduction of Adi Sankara’s works and teachings to the masses. Whether in his writings or his orations, Swami Chinmayananda was famed for his depth, clarity, eloquence, wit, and humor. Serving humanity endlessly and tirelessly until his last day, he daily expounded in colloquial terms the philosophical truths from Advaita Vedanta in every nook and corner he reached. In his 42 years of relentless service, Swami Chinmayananda left an indelible mark in the hearts and minds of people, and his footprints in the multifarious service projects he inspired in the Mission. He created a vast legacy – a global organization committed to Vedanta and also started numerous educational institutions and social service projects. He lives on in the priceless publications of Chinmaya Mission and in the hearts of millions as a saint and teacher extraordinaire. Swami Chinmayananda’s life was indeed a saga of immeasurable strength, boundless love, tireless service, and metaphysical reach.